The comments below are focused on the Toronto and Region Conservation Authority’s proposed destruction of over half of the last remaining natural sand beach on the mainland of Toronto, from the Grey Abbey shore, eastward to the western boundary of East Point Park. This proposal was put forward at the public meeting held on June 28, 2016, at Blessed Cardinal Newman High School. The ESA and ANSI designations applicable to subject area, as stated in the Scarborough Waterfront Project, Environmental Assessment Terms of Reference, 7.2.7, Significant Natural Areas, p. 38. The petition noted above and other comment received by the TRCA, both in advance of June 28, 2016 and at the meeting, indicates that a vast and growing number Torontonians have no appetite for obliterating a natural beach in favour of an elevated roadway of “clean fill” and armour rock. It is true, the opposite viewpoint (paving the beach) was uttered by some who attended the June 28, 2016 meeting. It is my respectful view however that public opinion should not be the ultimate driver of the matter of whether the beach is destroyed or saved. A matter as serious as the destruction of the majority of the last remaining natural beach on the mainland of Toronto should not come down to a popularity contest between the parties who would save it and those who would destroy the beach. In my view, the real issue to be decided is whether the process of shoreline hardening proposed by the TRCA will cause fundamental and irreversible damage to the shore and near shore areas of the subject area. If serious environmental damage is the likely result, the further issue is whether the TRCA is justified in committing such harm to the natural environment. 5.2, Site Recommendations, p. 28. In order to maintain a healthy level of biodiversity at the Scarborough Shoreline, the overall integrity of the natural heritage system that includes the site must be protected. The first priority should be to focus on maintaining conditions that allow existing communities or species of conservation concern to thrive. 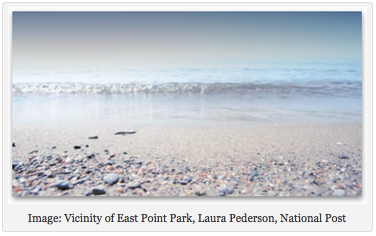 This is especially true of East Point Park, and also the beach habitats that are threatened by shoreline hardening. c. Shoreline hardening has been necessary to protect property (and tableland habitat) from erosion along much of the Scarborough Shoreline. Further hardening should be restricted to areas where it is absolutely necessary for erosion protection. Natural shoreline conditions and beach habitats should be maintained, for example, across much of the eastern part of the study area (e.g. East Point Park and vicinity). b) Is the TRCA justified in destroying the shore? Nancy Gaffney, Waterfront Specialist at the TRCA, indicated at the June 28, 2016 meeting that, “the first objective” of the TRCA mandate is conservation. Given the TRCA’s stated mandate of conservation and the obvious harm that would result from the ruination of the beach, what is the overriding reason presented for its destruction? At the June 28th meeting, the TRCA put forward the concern of erosion, and the dangers that the natural process presents to the public, as the primary reason(s) for the removal of the beach. (It is interesting and somewhat curious to note that the TRCA does not seem to have the same concern about erosion with respect to the portion of the beach they intend to save.) If erosion is indeed a legitimate and pressing concern, there are innovative and creative ways of addressing its harmful effects that do not involve the destruction the beach. For example, please consider the approach proposed by the TRCA in the West Segment at Bluffer’s Park. Mr. Worrell, it is inimical to the public interest to destroy the beach when alternatives exist to remediate it (if indeed remediation is even necessary). In this era of climate change, and with the effects of global warming all around us, we need twenty-first century solutions to waterfront development. History shows that the natural environment never wins, that wildlife never wins, and that people never win when our natural beaches are destroyed. Please do the right thing and save this beach.